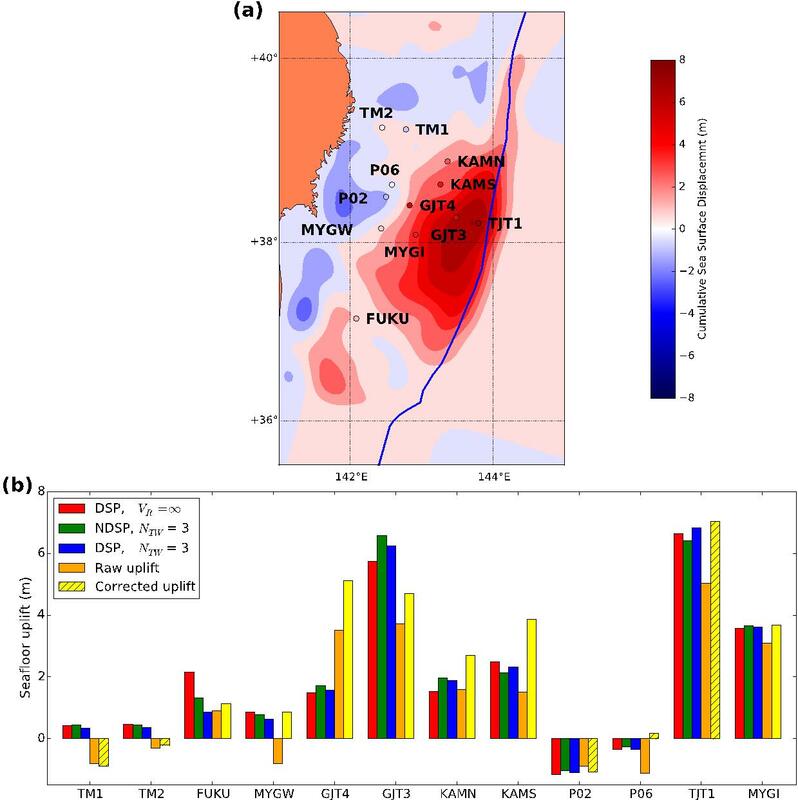 Rapid, accurate and reliable estimation of earthquake slip distributions and sea surface displacement associated with undersea earthquakes. The effects of sedimentary basins (mainly in Indonesia) on the focusing and amplification of seismic waves. Characterisation of earthquake potential through measurement of crustal strain accumulation. Improving tsunami warning systems through rapid and reliable earthquake source characterization and tsunami forecasts. Earthquake source effects on ground motion and building damage. Through my work at Geoscience Australia, I am also involved in efforts to assist developing countries in the Asia-Pacific region to improve their ability to assess earthquake and tsunami hazard. Figure 1. Comparison of modeled sea surface displacement with seafloor measurements for the 2011 Tohoku-oki earthquake. (a) Cumulative sea surface displacement estimated from inversion of tsunami waveforms, with locations of seafloor measurements indicated and colored according to the value of vertical displacement, corrected for horizontal movement. (b) Cumulative seafloor displacement calculated for different tsunami source models, plotted as red, green and blue bars. Also plotted are observed seafloor displacement: vertical uplift, and vertical uplift adjusted for horizontal displacement in order to compare with sea surface displacement (orange and yellow bars, respectively). Hatched yellow bars indicate OBP data adjusted for horizontal displacement calculated from a fault slip model; non-hatched yellow bars are GPS observations adjusted using measured horizontal displacement.